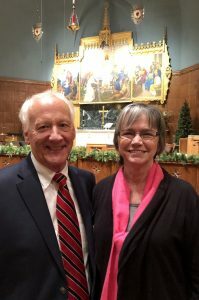 David Hord sang with the Chancel Choir on Dec. 30, then with the Men’s Chorus concert on Jan. 6. In between, he had a mild heart attack. About 2 pm after church on Dec. 30, David says he started to feel uncomfortable, with some pressure in his chest. “I felt a little pain radiating down my left arm,” he says. All the while, his wife, Bonnie had been sleeping on the couch. “I put on my shoes and grabbed my purse,” Bonnie remembers. “She rolled off that couch pretty fast, I grabbed my wallet, and we were out the door,” David adds. Because they live at High Rock Lake — 11 miles from Salisbury — they figured they’d better just drive to the hospital rather than waiting for an ambulance. Bonnie, who was driving, finally asked David what was wrong. He told her, as he was watching his heart rate on his Fitbit. In the meantime, David says, Bonnie was “cruising through Spencer” at about 65 mph with her flashers on. A police officer saw them, but did not stop them, she says. When they got to the Emergency Department of Novant Health Rowan Medical Center, David was seen immediately. Later that afternoon, Bonnie went home to get some things for David, including clothing for a stress test the next day, which was New Year’s Eve. David stayed overnight in a regular room on the cardiac care unit, and had bloodwork done every three hours. Tests showed his enzyme levels were increasing. Heart attacks don’t immediately show up in tests, David notes. So instead of a stress test, David had a heart catheterization with Dr. Apur Kamdar, a cardiologist. David has four sisters, and Mary Jo Whitley, who lives in Winston-Salem — she’s the closest in distance — came to sit with Bonnie during the procedure. “Her husband had a triple-bypass, and she said it was time to return the favor,” Bonnie says. The couple’s two children, Alice Railton of Charlotte, and Dee Hord of Garner, also came. 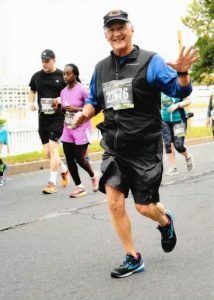 David Hord ran the Marine Corps Marathon in October, then had a heart attack two months later. The cath showed 70 percent blockage in one artery, as well as a narrowing of that same artery. A stent took care of both issues. David’s dad died of a heart attack at age 56, so David — who turned 66 on Jan. 26 — decided to make some lifestyle changes about 10 years ago. He started walking, lost a good amount of weight, and eventually began running. He started running 5Ks in 2012, and worked up to half-marathons and marathons. So he was a bit taken aback by the heart attack. But he thinks the changes he’d already made were what saved his life — that and seeking immediate medical attention when he felt something was wrong. His internist has advised him to lose weight, and his cardiologist has advised him to stay on his medications and watch his diet. In February — Heart Month — he’ll enroll in the hospital’s cardiac rehabilitation program. He’s returned to work in the EC department at Carson High School, where he’s taught since they opened the doors in 2006. He’s retiring in June. He and Bonnie have three grandchildren, with another due in February.